This page is about the modern region. 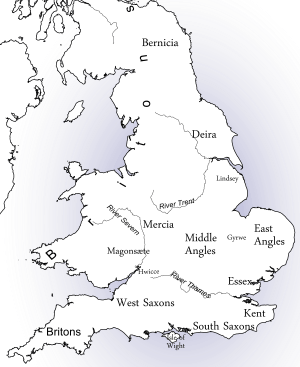 For the Anglo-Saxon kingdom, see Kingdom of East Anglia. 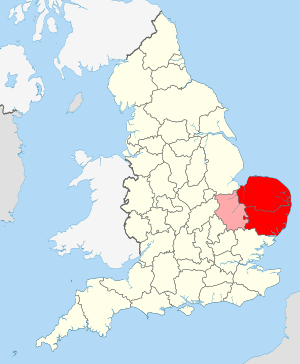 East Anglia is a geographical area in the East of England. The area included has varied but the legally defined NUTS 2 statistical unit, comprises the counties of Norfolk, Suffolk and Cambridgeshire, including the City of Peterborough unitary authority. 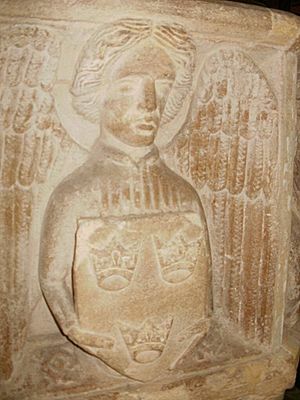 The name derives from the Anglo-Saxon kingdom of the East Angles, a tribe that originated in Angeln, northern Germany. Definitions of what constitutes East Anglia vary. The Anglo-Saxon Kingdom of East Anglia, established in the 6th century, originally consisted of the modern counties of Norfolk and Suffolk and expanded west into at least part of Cambridgeshire. The modern NUTS 2 statistical unit of East Anglia comprises Norfolk, Suffolk and Cambridgeshire (including the City of Peterborough unitary authority). 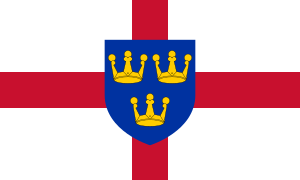 Those three counties have formed the Roman Catholic Diocese of East Anglia since 1976, and were the subject of a possible government devolution package in 2016. Essex has sometimes been included in definitions of East Anglia, including by the London Society of East Anglians. However, the Kingdom of Essex to the south, was a separate element of the Heptarchy of Anglo-Saxon England and did not identify as Angles but Saxons. The county of Essex by itself forms a NUTS 2 statistical unit in the East of England region. Other definitions of the area have been used or proposed over the years. 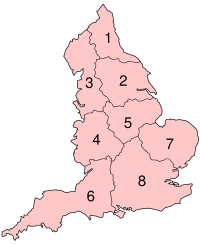 For example, the Redcliffe-Maud Report in 1969, which followed the Royal Commission on the Reform of Local Government, recommended the creation of eight provinces in England. The proposed East Anglia province would have included northern Essex, southern Lincolnshire and a small part of Northamptonshire as well as Cambridgeshire, Norfolk and Suffolk. The kingdom was formed about the year 520 by the merging of the North and the South Folk (Angles who had settled in the former lands of the Iceni during the previous century) and was one of the seven Anglo-Saxon heptarchy kingdoms (as defined in the 12th century writings of Henry of Huntingdon). For a brief period following a victory over the rival kingdom of Northumbria around the year 616, East Anglia was the most powerful of the Anglo-Saxon kingdoms of England, and its King Raedwald was Bretwalda (overlord of the Anglo-Saxons kingdoms). However, this did not last and over the next forty years East Anglia was defeated by the Mercians twice and continued to weaken in relation to the other kingdoms. Finally, in 794, Offa of Mercia had king Æthelberht killed and took control of the kingdom himself. Although independence was temporarily restored by rebellion in 825, on the 20 November 869 the Danes killed King Edmund and captured the kingdom (see Ivar the Boneless). By 917, after a succession of Danish defeats, East Anglia was incorporated into the Kingdom of England by Edward the Elder, afterwards becoming an earldom. Despite some engineering work in the form of sea barriers constructed by the Roman Empire, much of East Anglia remained marshland and bogs until the 17th century. From this point onward a series of systematic drainage projects, mainly using drains and river diversions along the lines of Dutch practice, converted the alluvial land into wide swathes of productive arable land. East Anglia, which based much of its earnings on wool, textiles, and arable farming, was a rich area of England until the effects of the Industrial Revolution saw manufacturing and development shift to the Midlands and the North. During the Second World War, the Royal Air Force and the United States Army Air Forces constructed many airbases in East Anglia for the heavy bomber fleets of the Combined Bomber Offensive against Nazi-occupied Europe. East Anglia was ideally suited to airfield construction as it comprises large areas of open, level terrain and is close to mainland Europe. The reduced flight time to mainland Europe therefore reduced the fuel load required and enabled a larger bomb load to be carried. Many of these airfields can still be seen today, particularly from aerial photographs, and a few remain is use today; the most prominent being Norwich International Airport. Pillboxes, which were erected in 1940 to help defend the nation against invasion, can also be found throughout the area at strategic points. East Anglia is bordered to the north and east by the North Sea, to the south by the estuary of the River Thames and shares an undefined land border to the west with the rest of England. Much of northern East Anglia is flat, low-lying and marshy (such as the Fens of Cambridgeshire and Norfolk), although the extensive drainage projects of the past centuries actually make this one of the driest areas in the UK. Inland much of the rest of Suffolk and Norfolk is gently undulating, with glacial moraine ridges providing some areas of steeper areas relief. The supposed flatness of the Norfolk landscape is noted in many famous pieces of literature, such as Noël Coward's Private Lives – "Very flat, Norfolk" and often leads to some confusion when people actually see the relief. On the north-west corner East Anglia is bordered by a bay known as The Wash, where owing to deposits of sediment and land reclamation, the coastline has altered markedly within historical times; several towns once on the coast of the Wash (notably King's Lynn) are now some distance inland. Conversely, over to the east on the coast exposed to the North Sea the coastline is subject to rapid erosion and has shifted inland significantly since historic times. Major rivers include Suffolk's Stour, running through country beloved of the painter John Constable, and the River Nene. The River Cam is a tributary of the Great Ouse and gives its name to Cambridge, whilst Norwich sits on the River Yare and River Wensum. The River Orwell flows through Ipswich and has its mouth, along with the River Stour at Felixstowe. The Norfolk and Suffolk Broads form a network of waterways between Norwich and the coast and are popular for recreational boating. The Ouse flows into the Wash at King's Lynn. 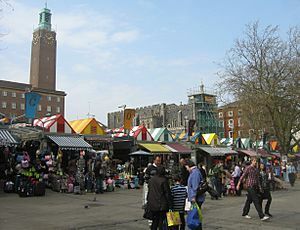 Major urban areas in East Anglia include the cities of Norwich, Cambridge, Peterborough and Ipswich,. Smaller towns and cities include Bury St Edmunds, Ely, Lowestoft, Great Yarmouth and King's Lynn. Much of the area is still rural in nature with many villages surrounded by agricultural land. The landscape of Cambridgeshire and Norfolk has been heavily influenced by Dutch technology, from the use of red clay roof tiles to the draining of The Fens. The climate of East Anglia is generally dry and mild. Temperatures range from an average of 1-10 °C in the winter to 12-22 °C in the summer, although it is not uncommon for daily temperatures to fall and rise significantly outside of these averages. Although water plays a significant role in the fenland and broadland landscapes, the area is among the driest in the United Kingdom and during the summer months, tinder-dry conditions are frequently experienced, occasionally resulting in field and heath fires. Transport in East Anglia consists of an extensive road and rail network. Main A roads, such as the A12 and A47 link the area to the rest of the UK, and the A14 links the Midlands to the Port of Felixstowe. This is the busiest container port in the UK, dealing with over 40% of UK container traffic and a is a major gateway port into the country. There is very little motorway within East Anglia. Rail links include the Great Eastern Main Line from Norwich to London Liverpool Street and the West Anglia Main Line connecting Cambridge to London. Sections of the East Coast Main Line run through the area and Peterborough is an important interchange on this line. The area is linked to the Midlands and north-west England by rail and has a number of local rail services, such as the Bittern Line from Norwich to Sheringham. East Anglia is ideal for cycling and National Cycle Route 1 passes through it. Cambridge has the largest proportion of its residents in the UK cycling to work with 25% commuting by bicycle. The city is also home to the Cambridgeshire guided busway, which at 13.3 miles (21.4 km) was the longest stretch of guided bus-way in the world when it opened in 2011. The only major commercial airport is Norwich International Airport, although London Stansted Airport, the fourth busiest passenger airport in the UK, lies just south of Cambridge in north-west Essex. Great Yarmouth and Lowestoft Enterprise Zone, an enterprise zone initiated by New Anglia Local Enterprise Partnership, was announced in 2011 and launched in April 2012. It includes six sites with a total area of 121 hectares (300 acres), which have attracted a number of energy-related businesses. The sites are Beacon Park and South Denes in Great Yarmouth, Mobbs Way, Riverside Road and South Lowestoft Industrial Estate in Lowestoft and Ellough Business Park in Ellough near Beccles. There is also an enterprise zone in Cambridgeshire, Alconbury Enterprise Campus in Huntingdon. The East Anglian flag as it is known today was proposed by George Henry Langham and adopted in 1902 by the London Society of East Anglians (established in 1896). 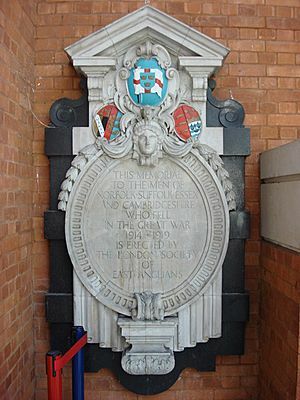 It superimposes the three crowns in a blue shield on a St George's cross. East Anglia features heavily in English literature, notably in Noël Coward's Private Lives and the history of its waterways and drainage forms the backdrop to Graham Swift's novel Waterland. The area also figures in works by L.P. Hartley, Arthur Ransome and Dorothy L. Sayers, among many others. East Anglia has a wide range of holiday resorts that range from the traditional coastal towns of Felixstowe and Lowestoft in Suffolk and Great Yarmouth and Hunstanton in Norfolk, to small fishing villages like Aldeburgh and Southwold in Suffolk. Other tourist attractions include historic towns like Bury St Edmunds, Cambridge and Ely as well as areas such as Constable Country, the Broads and the North Norfolk coast. East Anglia Facts for Kids. Kiddle Encyclopedia.